Co-founder of Thomas Group Consulting, Inc.
Terence A. Thomas is co-founder of Thomas Group Consulting, Inc., a multi-client public affairs and management consulting organization providing professional and technical services to public and private entities and interests. TGC’s diverse business practice serves diverse interests and organizations, such as private for profit corporations, health care organizations, educational service providers, governmental units, and human service organizations. 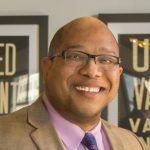 Prior to establishing TGC, Thomas was the chief advocacy and corporate responsibility officer at St. John Providence Health System (an Ascension Health Ministry) and oversaw compliance, risk, corporate, legal and government affairs. Prior to joining the healthcare provider, Thomas was a principal at Miller, Canfield, Paddock & Stone, P.L.C., Michigan’s largest and oldest law firm. His areas of practice included commercial litigation, intellectual property and emerging business development.